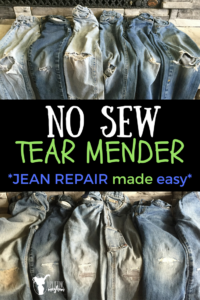 NO SEW Tear Mender – Jean Repair made EASY! If you don’t already know, I am a mother of 5 handsome boys! To say they are crazy would be an understatement. They feed off of each other and are continuously going and going! Although it can get a little crazy in our household, there are some perks to having 5 boys close together in age. The first is, they always have someone to play with. Second, Clothes are easy to manage as I pass them down to the next boy in line. However, I have found that there are 2 things that don’t make the cut from boy to boy. These 2 things are SHOES, and JEANS. SERIOUSLY! I can’t keep my boys in nice jeans or shoes long enough. They always manage to get a hole. I have heard that if you buy nicer shoes they will last longer. This sounds great, but I haven’t tested the theory. Spending $100.00 on a pair of shoes scares me, as I watch my kids slow down on their bikes using the toes of their shoes! It’s almost as bad as nails on a chalk board!! Jeans go even faster! My boys love to wrestle! Nothing wears the knees out more that rolling and moving around on the carpet, or making a sliding tackle playing soccer in the back yard! As one gets a hole, it gets thrown into the “NEED TO MEND” pile! This gets to be a pretty big stack of jeans when you have a husband and 5 little boys contributing! The other day my husband found this pile and while watching General Conference, he busted through the pile and fixed all of the pants! “YOUR HUSBAND SEWS?? ?” you might ask! No…..he doesn’t! But he does know how to use a NO SEW TEAR MENDER! This stuff is pretty sweet! It is called Bish’s Original Tear Mender – Instant Fabric & Leather Adhesive. 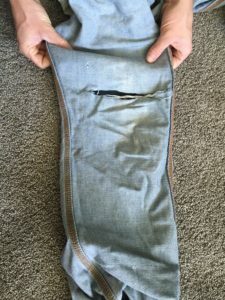 It extends the life of your boys pants. It is waterproof, quick drying, and flexible. It dries in 3 minutes and machine washable in 15 minutes! 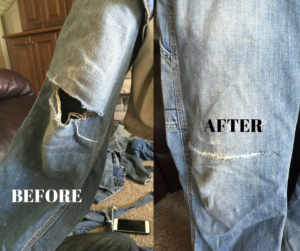 STEP #1 – Get a pair of pants with a hole! 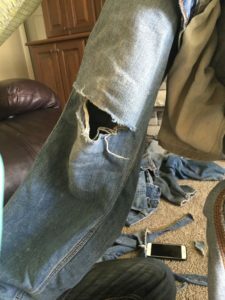 Here is a pair of my husbands pants, featuring a HOLE!! 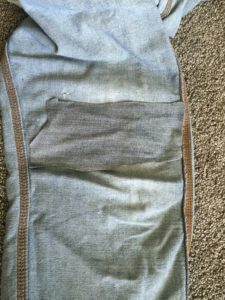 Step #2 – Turn the pants inside out. 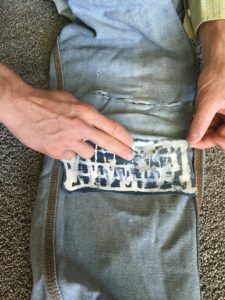 Step #3 – Cut a patch piece of denim to cover the entire area of the hole. Be generous. This will only reinforce and make the jean stronger. 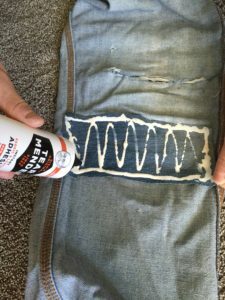 Step #4 – Place tear mender glue all on one side of the piece of denim. 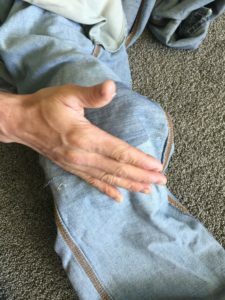 Step #6 – Place the denim piece over the hole. 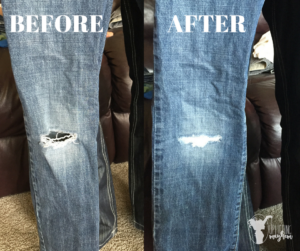 Make sure the hole is smooth and flat before you place the denim on it. Press the two pieces firmly together. Step #7 – That is it!! ALL DONE!! 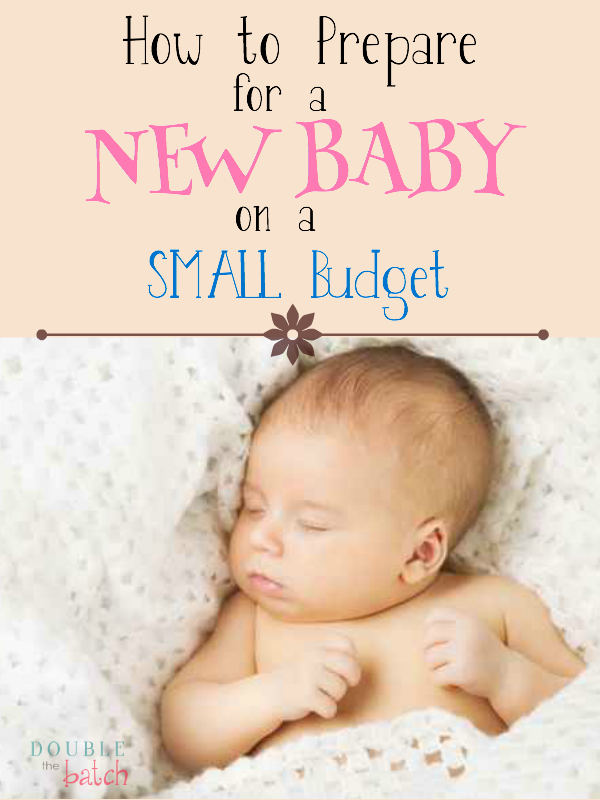 Super easy and fast! This works fabulous! The only downfall I have seen from using this product is that after a lot of washes it begins to discolor the glue through the fabric. It turns a brownish color. This really doesn’t bother me since these jean’s life has already been extended. It does its job and does a great job! Here is another one! ENJOY!! ITS FAST AND EASY!! GOOD LUCK!